i hope you have a wonderful new year, Kandee :) thanks for being so encouraging. Your so awesome Kandee! You always make me feel good. Can't wait for a Glaminar in Vegas! Have you trademarked that? If not you should! Wow Kandee. Something that I've been struggling with lately that erupted just this evening applies to what you have said & you also gave me an answer at the same time. Holy cow you look SO much like your mom!!!! Is good that you had good times with your family! I hope you have countless good times with your family!! Lets get prepared for a new year! Oh Kandee! This is exactly what I needed to hear. Right now my heart aches for a certain family member. They are hurting everyone in the family and have no remorse, but if they only looked around really hard they will learn that it's okay and there is a group of people that loves them. Kandee, you, your sister, and mom favor so much! Your mom looks like she could be your sister! And I want to squeeze your niece's cheeks right off! Hope you and your family have a wonderful holday and a happy new year! I love your blog! You are so inspiring!! you and your sister are both sooooo beutiful and your niece.... those cheeks!!!!! 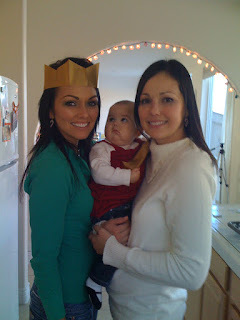 Kandee, your family is so beautiful! I love your little niece, she's a sweetie! Thanks for sharing this pictures with us! 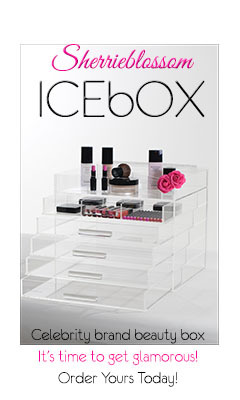 Kandee, not sure if u can help me...but I've been looking everywhere for clear storage containers for my makeup...I've got tons of makeup but have it in different containers in different parts of my room...I'd prefer something stackable that rolls out so i could have easy access to all my makeup...not sure how u could respond, but I'll wait for a video or maybe a response on here, Thanks! Hope you had fantastic holidays. You look so much like your mam! Your family is beautiful. Hope you have a Happy New Year! Kandee, your words are exactly what I needed... Thank you for your encouragement. Happy new year Kandee!! 2010 is going to be incredible! its kinda hard for me to follow fast english speak :-D anyways... you're great!! Your mother looks identical to you! She's beautiful! I hope you had a great year this year and can make it an even better year in 2010! I was nervous that the holidays might be too difficult to get through...I have a really condescending family & don't have much to do with them anymore. I have a daughter & I just wanted her to enjoy her 2nd Xmas. I wake up every morning and read Joyce Meyer (thanks to you), and have forgiveness in my heart for the rest of the day. Everyday gets better for me, and you are so much to thank for it. Your words are such inspiration, and your attitude about everything is what I idolize. I truly appreciate you Kandee, and you never cease to lift me up. I can only hope that in this new year, I can find friends that are as positive and wonderful as you are so I can be more positive and wonderful. *<3 Thanks Kandee!! And you're family is beautiful. You, your sister & your mom look very much alike. Beautiful!!! o.m.g. you and your mom are twins!! love it! btw i totally love your blog and what you do! i just graduated from cosmetology and find myself leaning towards makeup...i plan on doing it all but makeup is my fav! and i love that you do what i dream of!! i dont think i can accomplish what you have due to my schedule and children but can live vicariously through you!! I love how your niece is staring up at your crown like "what the heck is on your head?" haha. I am so happy that I found your videos Kandee... You have helped me learn so much about makeup! Thank you! I'm loving the picture of Uncle Guy with the wig and your mom is so beautiful! Brother-In-Law had to go to Iraq(hes in the national guard)that was sad..I lost My Grandpa,My aunt,My Grandmas Dog, and My Own Dog.It was Really hard when I lost Sugar(my dog).He was such a Joy to me!! I had him for 9 years..He slept with me every night and now its really weird with him not there.I keep dreaming about him.Its painful knowing that I cant remember what it was like having him here.I get a little better each day though. I'm only 13 but I know that when I have another a hard time in my life I can come here or on youtube and find joy from you! Keep up all the good work and Joy! Hope you had a very Merry Christmas. Enjoy your New Year's Eve. I know you're going to bring so much more light to our lives this next year. Also, I wanted to ask if you are going to continue the contest you listed in July "More than Makeup". I've looked for results on it and can't find them anywhere. I love the smile on your grandfathers face, it looks so serene. Your nieces cheeks looks so cute! Kawaii! Since, the first time I seen your blog on Tinkerbell make-up to all your messages about having strength in dealing with life. I really would like to thank you, for without that inspiration my life wouldn't have been the same. "if your heart is hurting or sad....just know that you are wonderful, everything you've done in the past can be washed clean, and everyday is a fresh start to enjoy and change your life....."
I googled for hours to see if you hand any brands of make up , i found your t-shirts and cups , but i would love to buy your brushes and make-up because from watching your vidoes i see you have such style . I'm happy you had a nice Christmas. And you look so much like your mom!!! 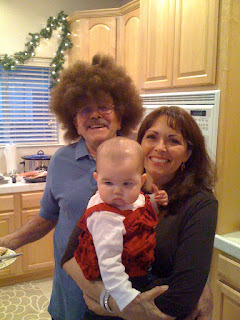 Ha, ha, ha, your granddad loss like Bob Ross with that wig. oh and your grandpa is so cool :] & you look so much like your mom.